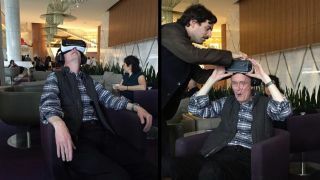 William Gibson is one of the most important science fiction writers ever, and at SXSW this month he got to see one futuristic bit of tech - virtual reality - finally brought to life. When the 67-year-old Neuromancer author strapped on a Samsung Gear VR for the first time, his initial reaction said it all: "They did it!" Ari Kushcnir, the executive producer with New York production company "m ss ng p eces" who introduced Gibson to VR, told Gizmodo that the influential writer "flipped out" after viewing an interactive ad for Dos Equis beer and a Sundance-praised short film called Strangers. Gibson had tried VR before, he later tweeted, but this was the first time it "really worked," he said. And Gear VR is old news compared to some of the more impressive VR demos we've seen. It makes you wonder what sci-fi pipe dream inventors will crack next (Asimov-style pocket supercomputers anyone? Oh, wait…). Aging sci-fi authors love TechRadar's blips. Can hatching chicks reveal who will win the Game of Thrones?